Visit us at the FHWA/PennDOT eConstruction Workshop in Pittsburgh, April 17-18! Contact us for more info. Pioneer™ is the concrete batch system designed to bring the batch process into the 21st century. Taking full advantage of PAC’s ruggedness, processing power, programmability, and network connectivity, Pioneer is a worry free system that moves trucks out of the yard quickly by batching concrete faster and more accurately. Managers can access Pioneer via a web browser to review inventory reports, assess batch performance and adjust settings as needed. Plus, the animated UI makes batching fun! Engineered for today’s fast-paced concrete industry, ConcreteGO™ is the only fully integrated cloud-based dispatch system on the market. 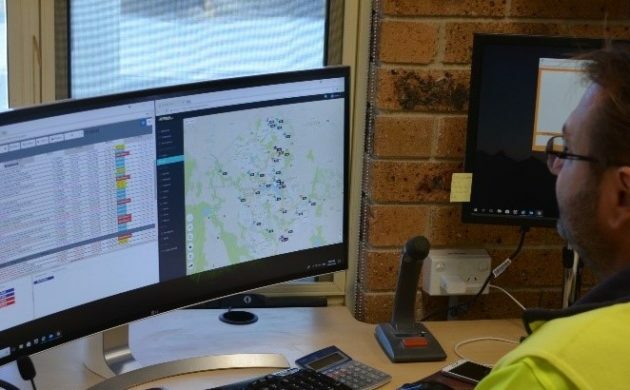 Logging onto ConcreteGO.com from a web browser, dispatchers and batch operators can gain secure access to central dispatch anywhere, at any time. It brings you closer to your customers. Robust KPI and dashboard tools provide operation insights in real time. ConcreteGO allows you to optimize your fleet and dispatch effectively without all the IT overhead. iStrada™ is the most comprehensive GPS/Paperless ticketing solution on the market. Manage your fleet with turn-by- turn routing and auto-statusing, while tracking the complete lifecycle of the ticket on your phone or tablet. Communicate with customers effortlessly using the iStada portal while the mobile app updates information in real time, allowing you and your customers to make better decisions. Simplifying the delivery process makes it easier for customers to do business with you. Sysdyne’s state-of-the-art material handling system maximizes your plant’s productivity and minimizes labor expenses. With Auto Seek-N-Feed, you no longer need to wait for materials in the middle of a load. This smart system gives you total control over your plant’s feeding operation. Operates in a totally automatic mode where the system constantly seeks bins to feed, keeping your plant continuously stocked with materials. Designed for use in processing plants which use bins (silos), chutes and conveyor or feed belts, the sensor is positioned in the flow of material. Measurements are taken 25 times per second as the material passes over or around the sensor face, allowing the sensor to rapidly detect changes in moisture levels. Real time adjustments are then made to the material during processing if required. This ensures that the manufacturer can continually produce a consistent product. Developed by Sysdyne, QuickLink™ enables data transfers between ConcreteGO™ or Pioneer™ to Quickbooks and other ERP or accounting software. Automated data transfers between programs allow businesses to sync Customer, Item, Project and Ticket data for invoicing. Additionally, it supports managing credit codes and balance amounts for credit limit management. QuickLink accelerates invoicing time, eliminates manual data entry and reduces chances of error. Take tighter control of your concrete quality using MRC-Pro™. It displays both mixing and total revolutions, as well as RPM and mixing time since last reset. Tamper proof reset interlock prevents altering of counts. It requires a reset cable to restart counts. Super bright LED display makes it easy to read under direct sunlight. Approved by NYSDOT and NJSDOT, MRC-Pro is required for state projects. Geotab's GPS tracking system for fleet vehicles links to the vehicle's engine computer to extract rich data, allowing for accurate reporting. Get seamless access to your fleet data with your comprehensive data integration and fleet analytics platform. Geotab has devices that provide the tools for "Management by Measurement." It all starts in the vehicle. Geotab has everything you need to meet regulations for electronic logging devices (ELDs) and more. Stay ahead of the curve with Geotab. Sysdyne is a forward thinking company focused on developing true cloud solutions that redefines the core business processes of concrete production. Our fully integrated products cover the entire spectrum of concrete operations; from sales, to production, to delivery management and billing. The innovative dispatch, batch control, delivery tracking, paperless ticketing and customer collaboration platform, help concrete producers worldwide run more efficiently and profitably. Customer satisfaction is Sysdyne’s top priority. We are committed to the best in class customer support by providing tailored solutions to meet each customer’s specific needs. As your digitization partner, we are here to help you grow your business by offering the best in cutting edge technology.